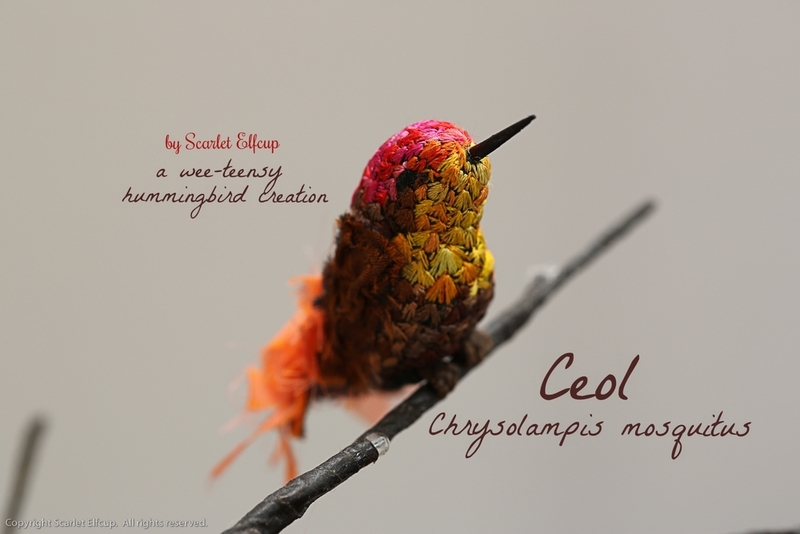 Introducing Scarlet Elfcup's newest tiny hummingbird creation...Ceol (pronounced Ky-ol). Ceol is the Irish word meaning music. This itty-bitty hummingbird loves to sing!! Before Ceol there were Scout and Pica. These tiny life-sized hummingbirds are thus far my most favorite creations to bring to life. They are inspired by true life species of hummingbirds. Like all the other Scarlet Elfcup creations, not one are alike. And, in the making of the hummingbirds, I delight in working with nature's greatest inception....colors...gloriously magnificent incredible colors that can never be replicated by human hands. Even so, bringing a hummingbird to life allows me the pleasure of working with a deep, rich and wide spectrum of beautifully colored threads. And the results never fail to make me gasp with enjoyment! Scarlet Elfcup's hummingbird creations are life-sized. The birds range from 3-5 inches (approx. 7-12 cm) long from beak to tail and stand at about 1 inch (about 2 cm) tall. 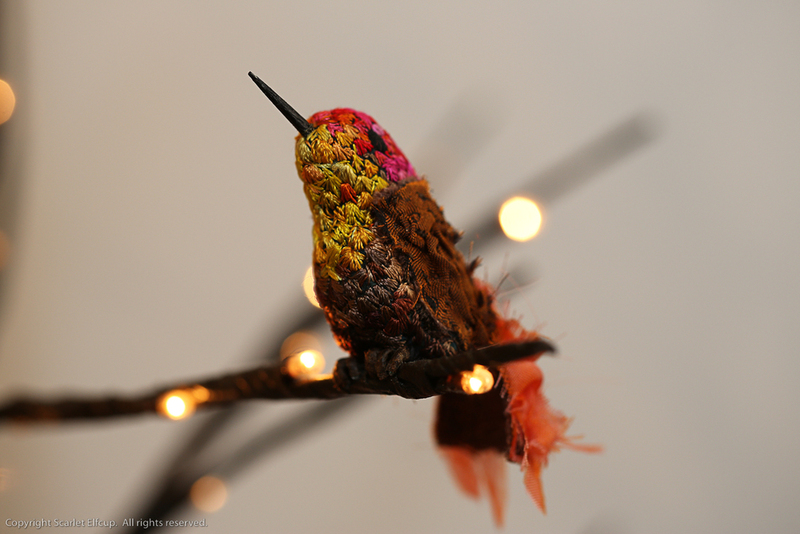 Each bird is decorated with nearly 1000 hand-embroidered stitches covering the body. And because these birds are hand sewn from start to finish, it takes nearly 30 hours of finely detailed needlework to complete one bird. Without further ado, let me introduce you to Ceol. Ceol's scientific binomial is Chrysolampis mosquitus, otherwise known as the Ruby Topaz. The Ruby Topaz is one of nearly 300 species of hummingbirds left in existence. They can be found mostly in northern South America. Compared to most other hummingbirds, the Ruby Topaz's long straight beak is relatively short. Ceol's body is made from mud silk. Mud silk is created through an incredibly fascinating process and dates back hundreds of years. It is also a very eco-friendly and sustainable process. This article, "Dye for Two Tones: The Story of Sustainable Mud-coated Silk," provides a very good take on the history of mud silking and talks about it's sustainability and eco-friendliness. If you want to see beautiful photos of the process, this site has a small article and lots of pictures. I chose mud silk for it's tight knit and firmness but yet still thin and pliable qualities. I wanted to embroider the fabric without layering backing into the fabric, which would add too much bulk for such a tiny creation. So, mud silk was the best quality for embroidering tiny stitches on a tiny object. Ceol is stuffed firmly with 100% carded wool. On top of the mud silk, Ceol's body is decorated with about 1000 stitches of over 25 different shades of embroidery thread. Ceol's wings are hand smocked using multiple layers of 100% silk and a 100% linen fabric. Ceol's tail is made from a 100% iridescent silk stitched on top of a 100% linen fiber. Ceol's beak is made from wood, colored with permanent black ink and attached with a tiny dab of industrial strength glue. Despite the industrial strength glue, the beak is still rather delicate because of it's miniscule scale and should be handled with the most gentle hands. In other words, Ceol is not a toy and should not be handled by children. Ceol has one fantastic addition that Scout and Pica did not have...FEET!!! Oh joy! Ceol's tiny taloned toes are the smallest bird feet to clasp on to anything around here. The toes are made with floral wire, wrapped in floral tape and then stitched firmly against the body with thread. The toes will clasp onto small branches and Ceol has the ability to sit prettily without assistance due to her tiny toes. I was so delighted to be able to give the hummingbird toes...it's a rather useful feature, you see! These toes allow a singing bird the much needed ability to perch on top of a branch, a tree, a book, a finger and sing to the heart's content. The higher the space is, the happier Ceol will be, for that is where musical sounds carry best throughout the house. Friends, I hand you...yet, another wee-itty bitty hummingbird created by Scarlet Elfcup...Ceol!